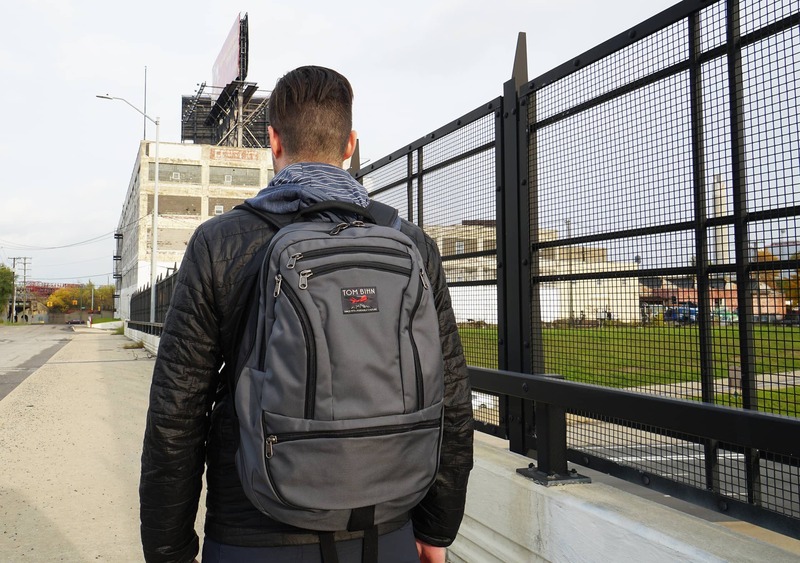 The Tom Bihn Synapse is a travel pack that consists of a classic design that has lasted through the ages plus a whole bunch of innovative thinking. 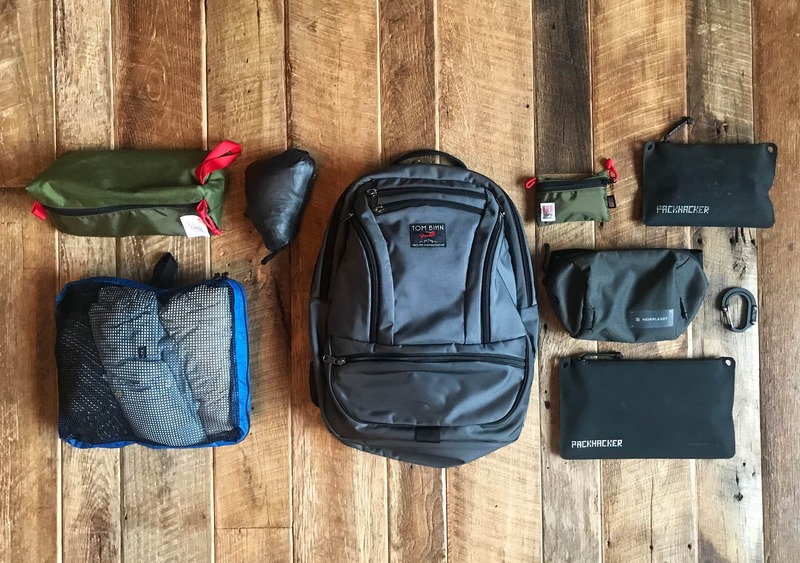 It’s made by a reputable brand that comes highly recommended from friends and folks in the backpack space, so we’ve been excited to get our hands on this particular pack and give it a good test run. But alas, that is not the case. Although Tom did start crafting bags at the young age of 10, the company currently has 47 members that all work in the same location and collaborate on all the gear they produce—which we think is pretty darn cool! After using their stuff for just a short time, you can tell they put a lot of thought and effort into creating innovative gear that functions well. But enough chit-chat. Let’s get into this review! At the time of this review, the Synapse is available in two sizes—the original 19-liter version and the 25-liter version that we’ve been testing. Overall, there are a lot of similarities between the two bags, but we’re going to be more focused on the 25-liter version for this review. The Synapse comes in a variety of colors and fabrics, plus you can choose between multiple internal liner colors and external colors. There are honestly too many to name, so be sure to go check those out on the product listing page if you want to see all the options. Our exterior fabric is the 525D ballistic nylon in gray, and our internal liner is the 200D halcyon fabric in island blue. Ballistic nylon is a great choice for durability, and while a lot of the most durable packs we’ve tested get up to 1000D or 1680D, we think 525D will be fine for this pack. We’ve found this stuff works well for the intended use-case and we’ve also noticed that it’s not quite as crunchy or swishy as the traditional Dyneema® branded fabrics we’ve tested in the past. It’s a bit softer to the touch, which is nice. Sometimes that stuff can be super crinkly and just straight-up loud as you’re messing around with it, so we’ve been happy to see that’s not the case here. We should note that there’s also a 400D version of the halcyon fabric that can be used on the exterior of the pack, in lieu of that 525D ballistic nylon. 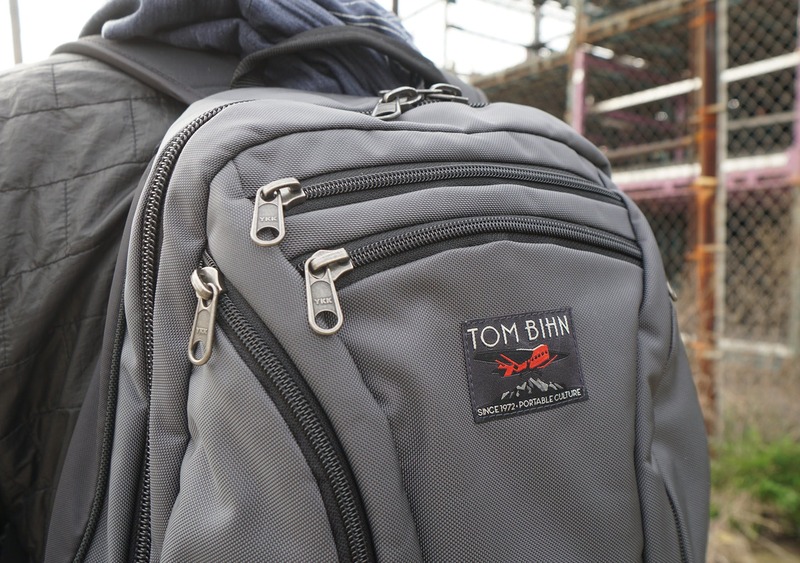 From a branding perspective, you’ll see a simple Tom Bihn logo pasted on the back of the pack. The overall shape of the pack is round and it definitely has that “turtle-like” shape going on, which does affect the functionality a bit (more on that later). We are not huge fans of the look of this pack, and when we polled our Instagram audience it was pretty close to a 50/50 split. It’s not the flashiest bag, but as you’ll see below, we’ve found the function really outweighs some of our misgivings related to the look. The bag definitely keeps a minimal exterior aesthetic, besides all the zippers going on. 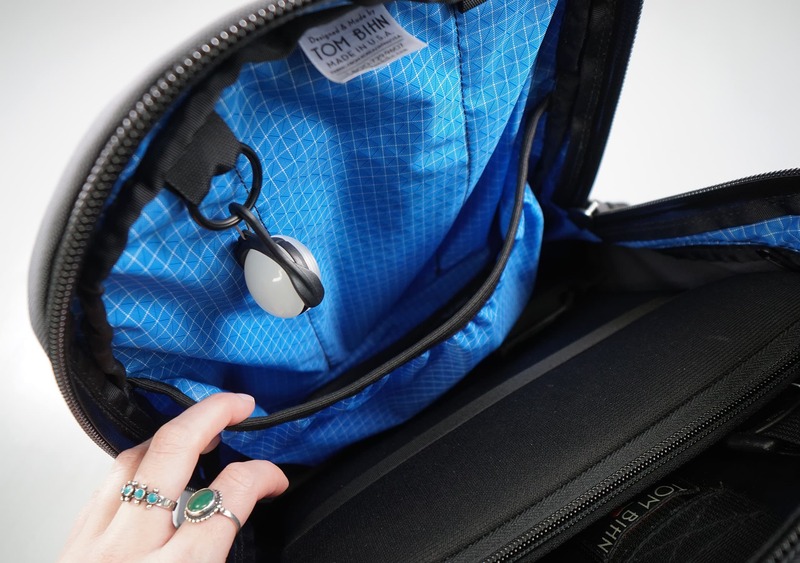 Side-note on those zips: Tom Bihn provides custom zipper pulls you can install yourself, which is pretty great. There are three brands of buckles for some reason—Duraflex, Nexus, and Woojin—which are all solid brands for plastic and metal hardware. There is some EVA foam in the shoulder pads for comfort. There’s a bunch of high-density padding in various areas of the pack, mainly the back panel. Overall, Tom Bihn has chosen some really solid and durable materials that come together to make a quality pack. And if anything doesn’t hold up over time, they’ve got a great warranty. They love standing behind their packs and they’re always iterating, tweaking and repairing packs at their USA-based production facility. So, if you do run into any issues, just give them a call. We’ll kick off the external components with the harness system. Starting at the top, there is a grab handle that has been recently updated to create a more comfortable grab. It used to just consist of a thin strip of nylon, but many customers and reviewers brought this up and they went ahead and changed this in later versions of the pack. It’s also more flush with the back of the pack than before, so when you’re hanging it on a pole or hook it will hang right against the wall. 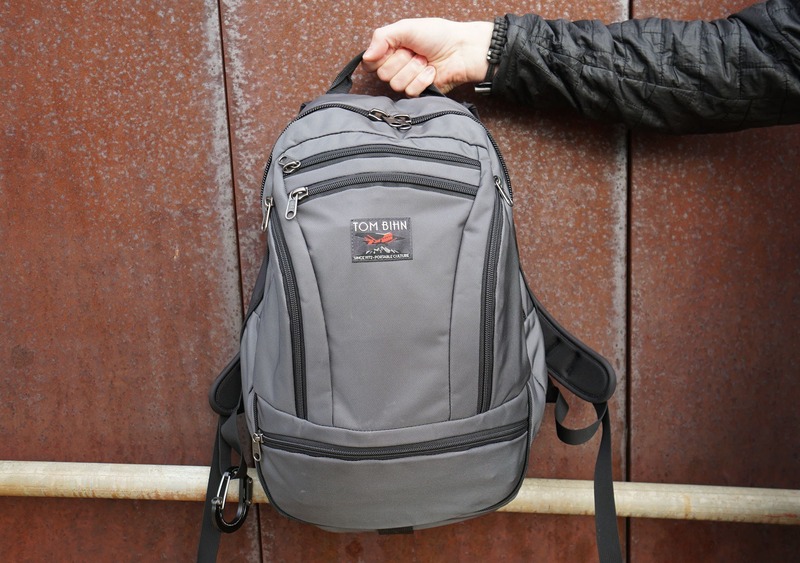 The folks at Tom Bihn have definitely iterated on this pack quite a bit, and it shows. Instead of coming up with bag after bag after bag, we’ve enjoyed watching them continue to iterate on the Synapse series. 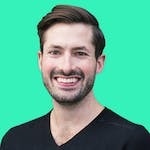 Each time they come up with a new iteration, it gets better—whether that means more colors, more functionality, or a little bit more thought on the design. These little increments provide a huge gain in the long run and we love to see manufacturers going this route—especially when they truly listen to their customers. The shoulder straps themselves are quite simple. They’re made of densely-padded foam with a stretchy material on the outside. Below, there’s a properly anchored sternum strap with adjusters on each end of the buckles where they attach. There’s also an optional clip for a hydration bladder hose. Towards the bottom of the pack there are two loops that are used to attach a hip belt, depending on if you’d like to use one or not. With a bag of 25 liters, your mileage may vary—we personally don’t think that you need one, but there are options if you want some more support. And lastly, there’s a piece of nylon webbing at the bottom to attach additional accessories. Not much else to say about that—it’s a piece of nylon. Moving on to the inside, there is a ton of internal organization in this pack and, overall, everything feels really well laid-out. However, we have noticed that it’s pretty difficult to use the entire liter capacity of the bag due to its round, “turtle shell” shape. 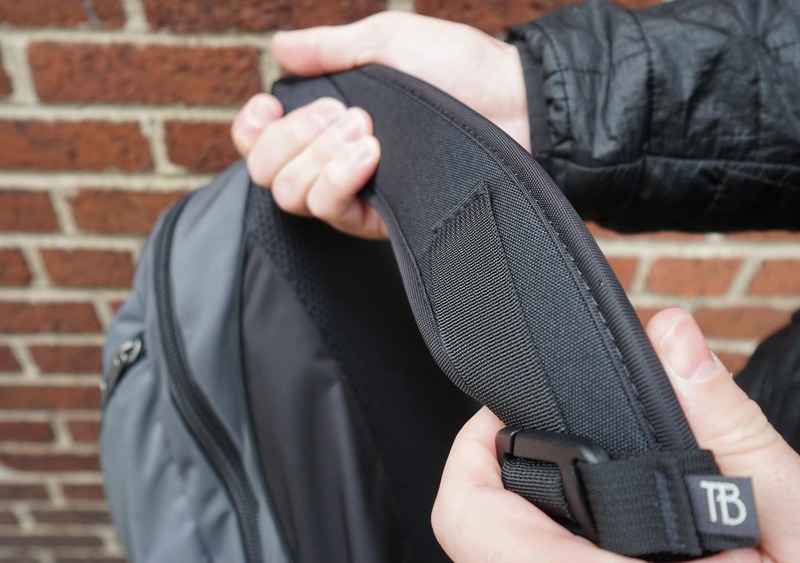 It also has a bunch of internal pockets that aren’t quite as efficient, space-wise, as one big clamshell would be. 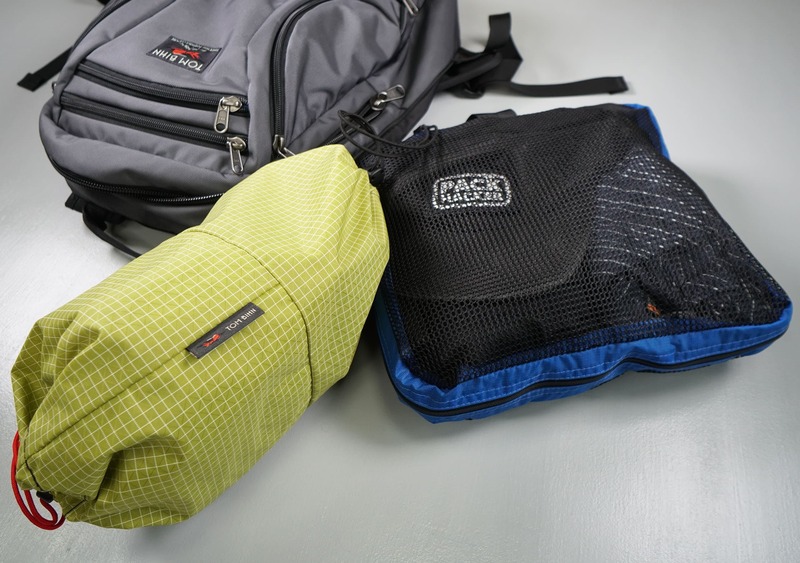 If you’re looking for more of a “giant bucket,” you might want to take a look at the Cotopaxi Allpa or the GoRuck GR1. Those bags have a nice clamshell compartment that you can easily pack up and organize to your liking. However, if you like a lot of smart internal organization, this could be a really great option for you. We’ll start by checking out the front pocket, which goes down about 8 inches in depth. 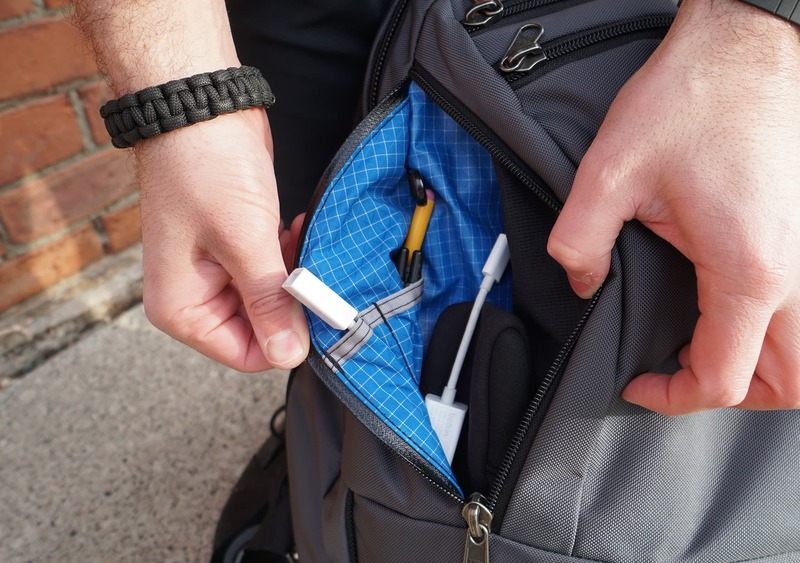 This area is going to be great for anything that you want quick access to—it’s definitely the easiest pocket to access on the entire pack. Behind that is a very deep pocket for a water bottle, which can fit a pretty large bottle. 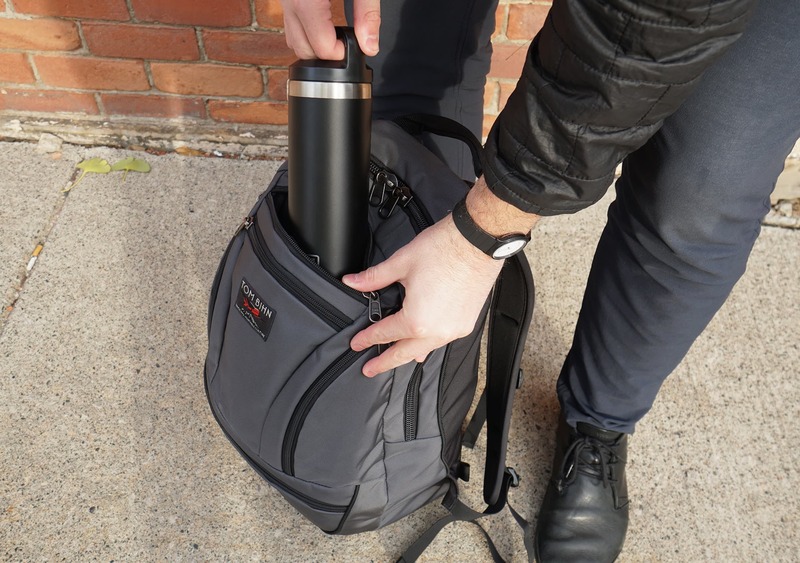 Unlike most packs, Tom Bihn has decided to place the water bottle pocket in the middle of the bag to optimize the balance and weight of a fully-loaded water bottle. Plus, it doesn’t look weird just hanging on the outside of your pack. This is certainly a different approach, and we like the thinking behind it considering a fully-loaded water bottle is probably going to be one of the heaviest items in your pack. However, you’re going to sacrifice some of that internal capacity by having your water bottle inside the pack, versus hanging on the outside. 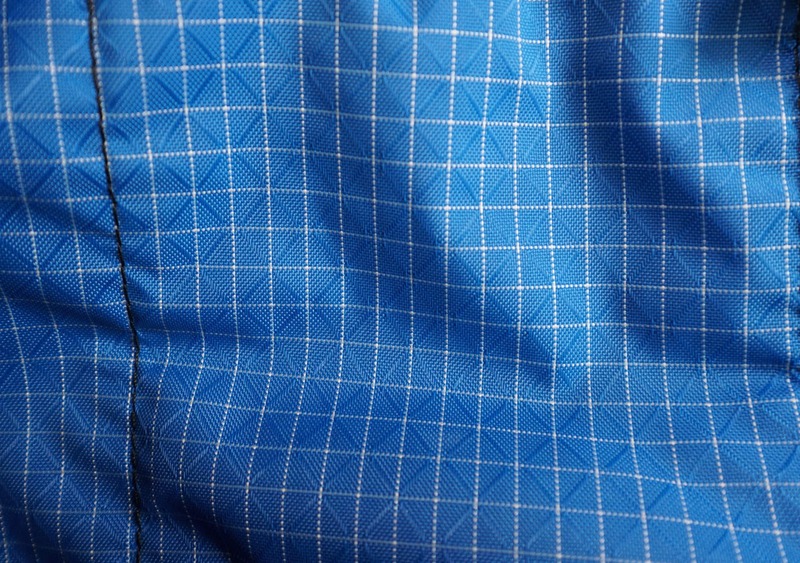 There are some stretchy mesh pockets on the side of that water bottle pocket which have that halcyon liner fabric. And we should note that while the halcyon fabric is weather-resistant, the stretchy mesh on the side is not. So if you are going to put a water bottle in here, you’ll want to make sure it’s not going to leak. Otherwise, you’re going to be in for a rough (or more accurately, wet) time—it’ll get right into the main compartment of the pack. 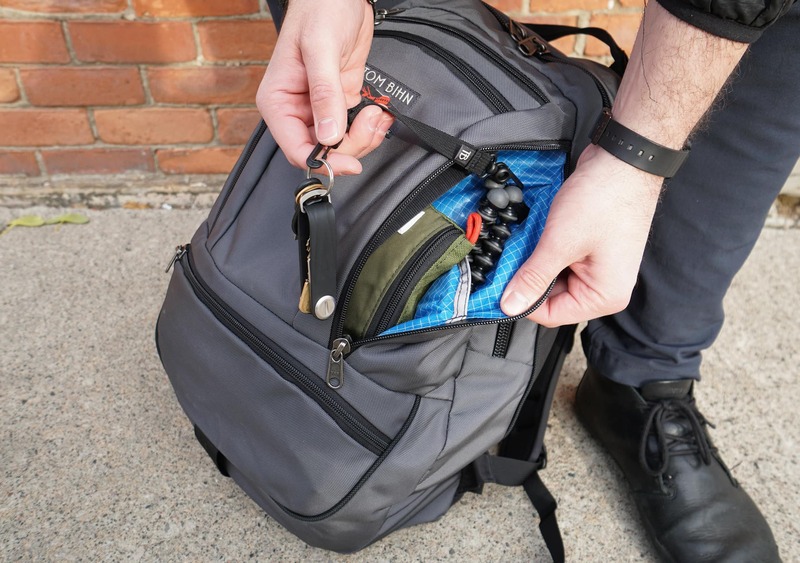 There is also an O-ring at the top of the water bottle pocket, which works well with a lot of the accessories that Tom Bihn sells or anything that you just need to clip on for a quick grab). Next up, the side pockets. These are easily accessible if you swing the bag around your body to the front. The wearer’s left pocket features ample space, an O-ring, and a halcyon pocket with three divisions. These divisions are good for pens, pencils, dongles, travel chapstick, sporks—you get the picture. The wearer’s right pocket is pretty much the same, except there is just one giant halcyon liner pocket that’s not divided at all. 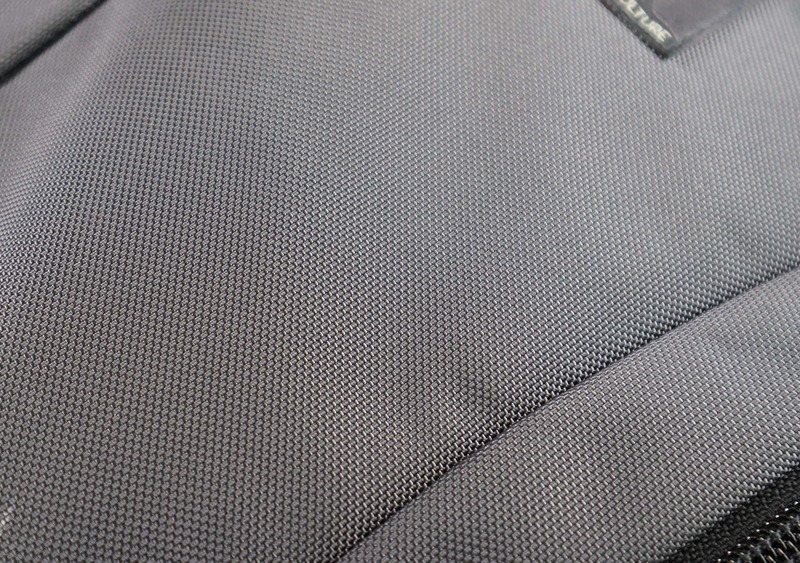 We’ve also been testing the Tom Bihn keychain here, with it attached to the O-ring. We’re happy to report that there’s enough slack in the lanyard to allow you to open doors while wearing the pack and swinging it around to the front. 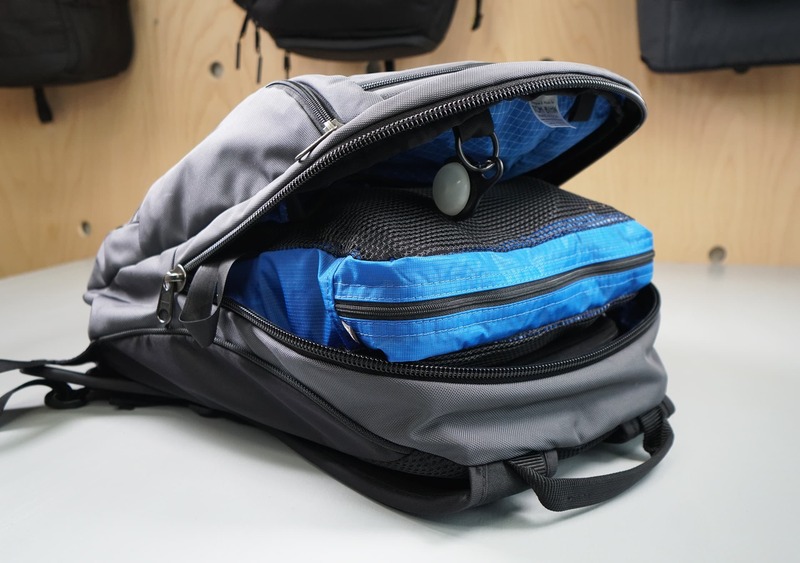 This is an awesome feature, and again, Tom Bihn has a ton of additional accessories that you can use with this space to customize everything to your liking. Next up is the lowest pocket on this bag—which has turned into one of our favorites. There is a lot more space inside this thing than you’d initially think. For example, we threw a MacBook charger, flat notebook, and the Matador Advanced Packable Daypack in this thing and still had room to spare. There are also three O-rings on the top as well (if you haven’t gotten the picture yet, there are O-rings pretty much all over this bag). The main compartment of the pack opens up in a horseshoe fashion, as opposed to a full clamshell. And unfortunately, this is the compartment that we have the most issues with. First of all, it’s not as large as you’d imagine because of all the other pockets inside this pack. Remember that water bottle pocket? Yeah, if you’re utilizing that you will lose a ton of space in this main compartment—which is kind of a bummer. On the front side of the flap, there’s a halcyon pocket with a stretchy top—and we think this divider pocket is a bit unnecessary, considering the main compartment is already so small. We’ve also noticed that it can get in the way as you’re opening the bag up and trying to organize things. And just as an additional note, there are also two pieces of nylon webbing at the top that you can use as attachment points. On the backside, there are two additional looped attachment points. 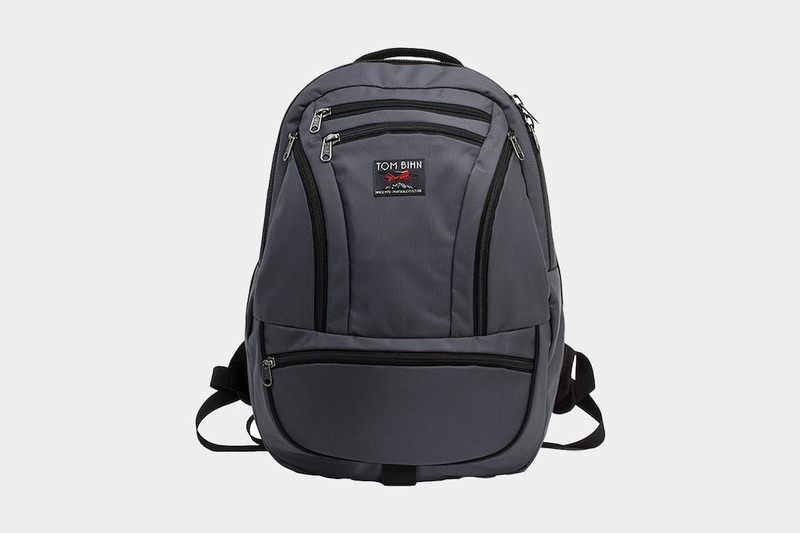 These are sold by Tom Bihn depending on the size of laptop that you’re looking to put in there. It provides a nice custom fit, which is great—that is, until you upgrade your laptop and need to buy another one. This little laptop “compartment” is designed very well, and the thinking here is that you can easily slide your laptop out when you go through security. 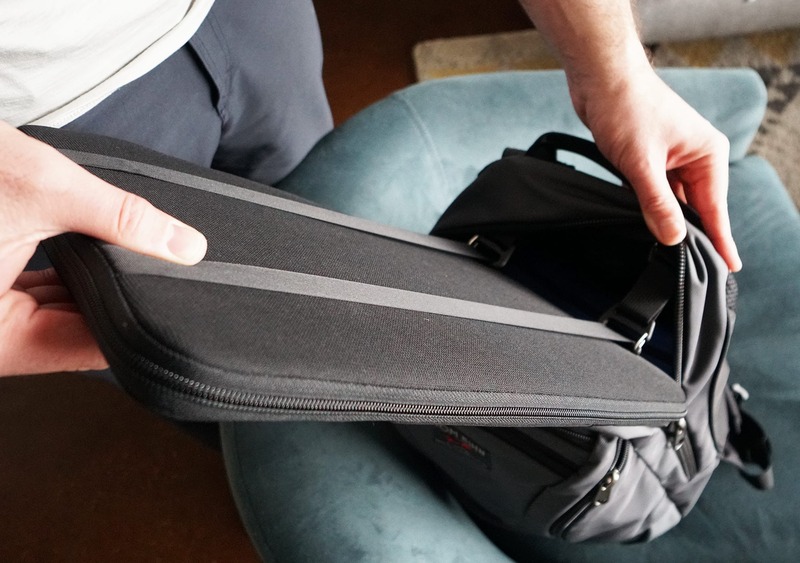 All you need to do is slide the laptop out and it will stay connected to your bag. Send it through the conveyor belt, pop the laptop back in, you’re good to go. While we haven’t tested this personally, a friend of ours has used this on about 20 different flights and only one time has a TSA agent told him to completely remove his laptop. We like those odds. And while that stuff is all great, in testing we have found this area to be less than ideal for a couple of reasons. First of all, there is some depth to the fabric, which makes it a little bit harder to slide your laptop in and out. 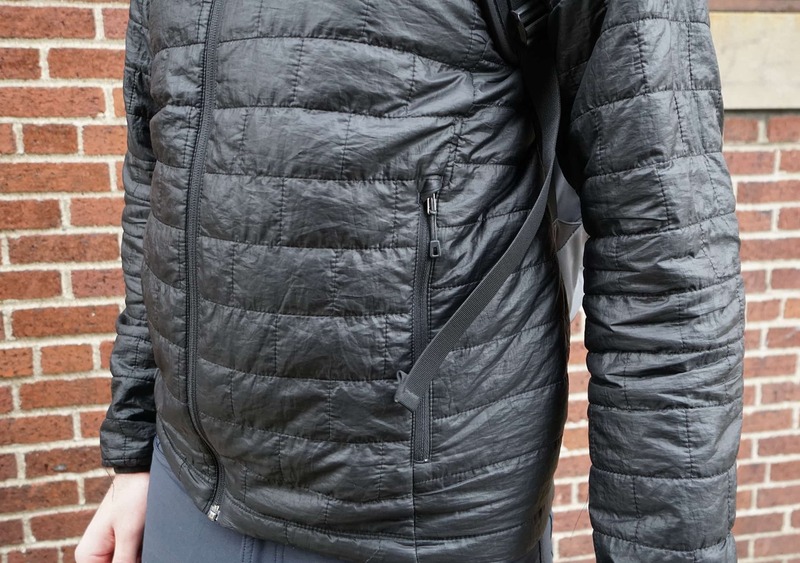 You kind of need to pull it forward to get it out easily—and we think that could have been negated if the zipper went all the way to the back of the pack. And our other gripe is that when the main compartment is full, it’s very hard to slide this thing in and out. You kind of have to separate the pack and jam it down in there when you’re done taking it out. Sometimes it might actually be easier to just unzip this cache and remove your laptop from it, depending on how full the main compartment is. This all seems like a bit of an oversight from Tom Bihn, especially when you consider that this system is supposed to be used when going through airport security…AKA, when your bag is most likely to be filled to the brim. Anyway, enough gripes. Let’s move on. Behind the main compartment, there’s space for an optional frame sheet. We would definitely recommend using a frame sheet on this pack, especially with the 25-liter version. 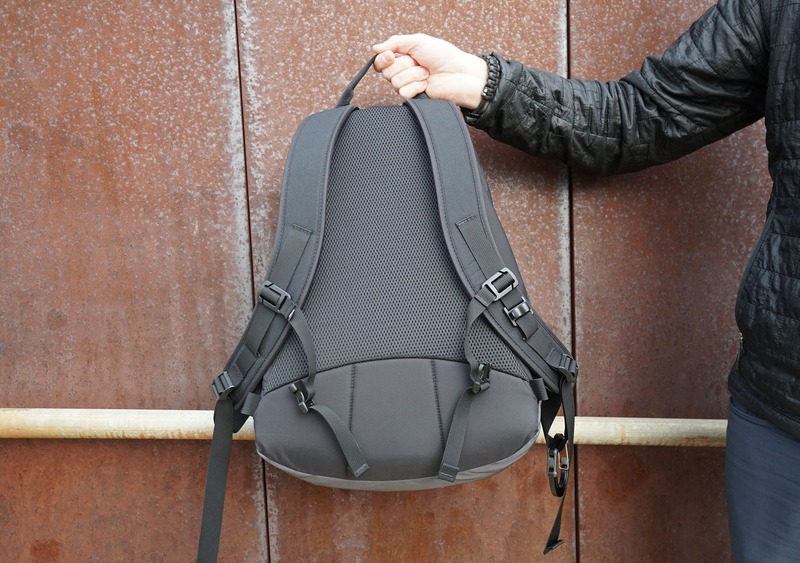 It gives the pack a little more structure and makes for a considerably more comfortable carry. With the frame sheet, the bag can also of stand up straight—depending on how you have the inside packed out—which is another added bonus. As for some of the other accessories that you can buy with this pack, we’ve been experimenting with two additional pieces from Tom Bihn. The first is the medium Tri-Star Packing Cube. We’ve been loving the mesh material, as it allows you to easily see what’s going on inside the cube. The skinny form factor also fits really well inside the main compartment of this bag. 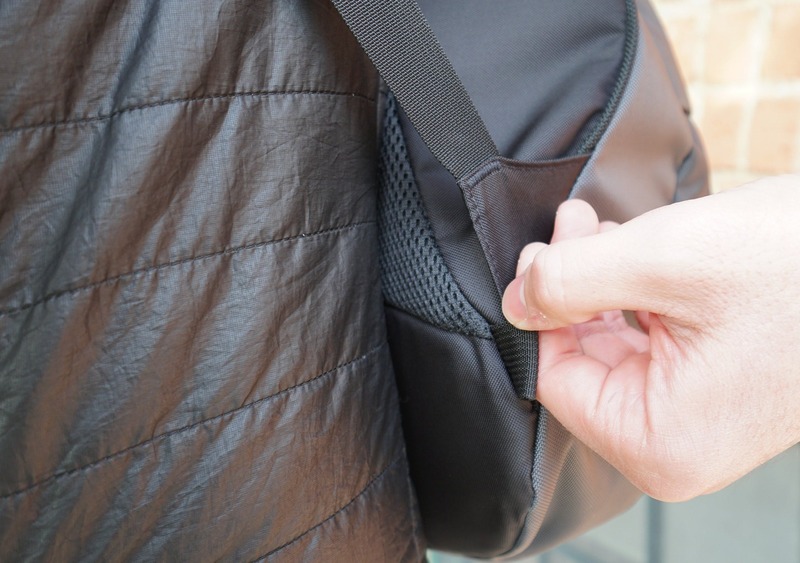 However, since it’s a bit skinnier and the zipper is in the middle, it can be a bit challenging to pack because you don’t have much depth on the sides to hold everything in place. Secondly, we’ve been using the Travel Laundry Stuff Sack. This sack has a really clever design—basically, the cylindrical sack has a divider on the inside that can move to either side of the pack. So clean clothes go on one side and dirty on the other after you’ve worn them—and each side will expand or compress based on how much you need to put in it. 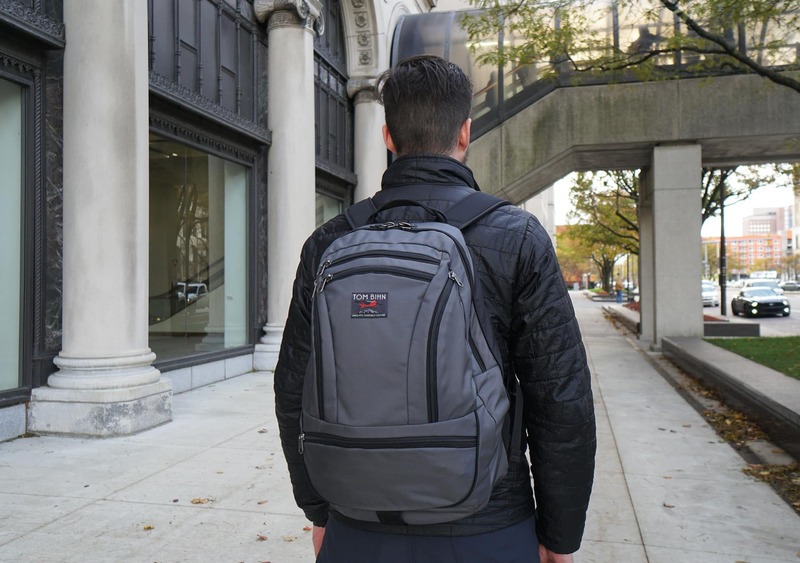 At the time of this review, we’ve been testing the Tom Bihn Synapse 25 for about three weeks, including a weekend train trip to Chicago. We’ve also chatted with our friend, Winston, who has been using the 19-liter version of this pack in black for over six months. Although we’re still not huge fans of the look of this bag, the more we use it the more we’ve started to really dig a lot of the features, the design, and the organizational features that come along with it. For a bag with a bunch of internal organization, it’s hard to beat. And in terms of durability, we haven’t had any problems yet. We’re confident that between the beefy zippers and 525D fabric, this bag will likely hold up for a long time to come. Not a huge fan of the look, but the pack feels great and we’re liking all the internal organizations. The more we use this thing, the more we like it! Mostly all of the internal organization is very functional, although the laptop compartment has given us some issues. Tom Bihn puts a ton of care, effort, and detail into the decisions they make when creating packs, and the Synapse 25 is no exception. They’ve continuously made minor improvements over the years that add up to huge gains that you can really feel when you’re using the bag. 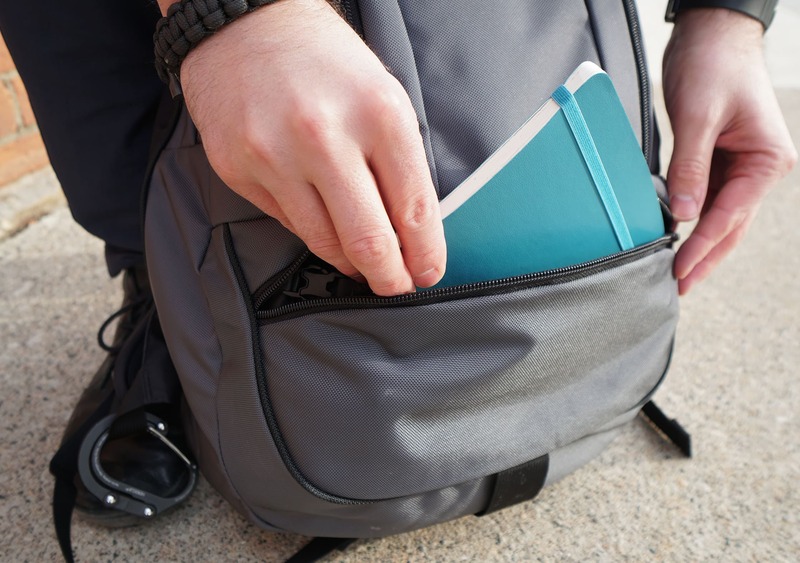 Although we have a couple gripes within the main compartment and don’t love the look of the pack, the overall benefits greatly outshine these gripes. We think this system could work perfectly for you with the right gear and a bit of strategic planning.